The object of the game is to defend your city from being obliterated off the face of your planet! 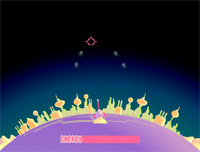 Use your cursor to aim and target enemies with your powerups. Press Z and X to move your tanks. Press A to switch tanks.